Last week I received an email from Sephora informing me about their newest VIB reward sampler and I knew I had to order something so that I could get my hands on it. So what was the sampler that motivated me to pull the trigger on the Supergoop! Everyday Sunscreen SPF 50 sitting in my cart? 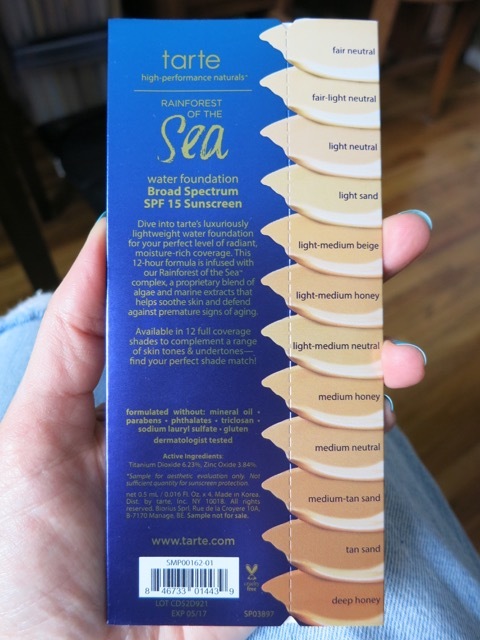 It’s a five-piece “discovery and skin care set” from tarte’s new Rainforest of the Sea collection, which I’ve been reading about and was excited to try for myself! 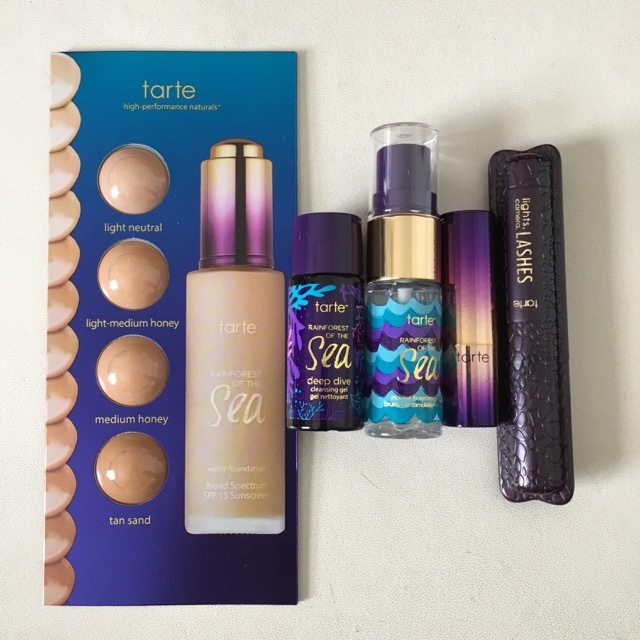 tarte touts their new collection as products that hydrate, brighten, and help protect your skin. The “Rainforest of the Sea” refers to strains of algae that have evolved to withstand the extreme conditions in the ocean’s depths; the brand sustainably harvests and processes said algae for use in this line of beauty and skin care products. I’m such a sucker for purples and blues, so the collection’s branding was bound to appeal to me. I love everything about the design on these products: the coral motif on the cleansing gel, the wave pattern on the facial mist, the sunset ombre vibe of the lipstick case. So let’s talk about the products one by one. First is the Water Foundation Broad Spectrum SPF 15 (full-size, $39), which comes with samples of four shades: Light Neutral, Light-Medium Honey, Medium Honey, and Tan Sand. Looking at the array of 12 shades on the back, I think my actual shade might be more Fair-Light Neutral, but I’ll certainly give Light Neutral a try. Not sure what I’ll do with the other three shades…maybe I can give them to friends with darker skin than mine. I’m not a huge fan of wearing traditional foundation (especially of the full coverage ilk as this one claims to be) but I’m open to seeing how this one looks and feels on my skin—and I appreciate that they threw SPF in it for some protection! Okay, so I take back the MLBB comment—the shade is too dark on me for that. 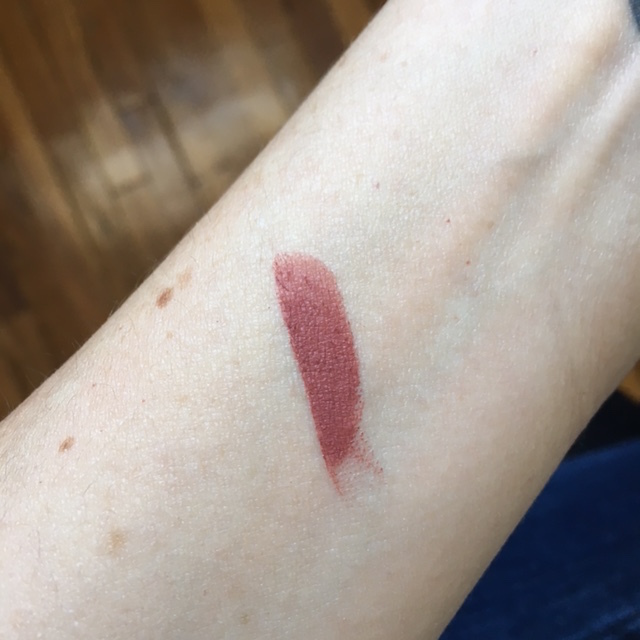 However, I do really like the color…it’s very much in the trendy “90’s are back” vein, only a little more pink and a little less brown. 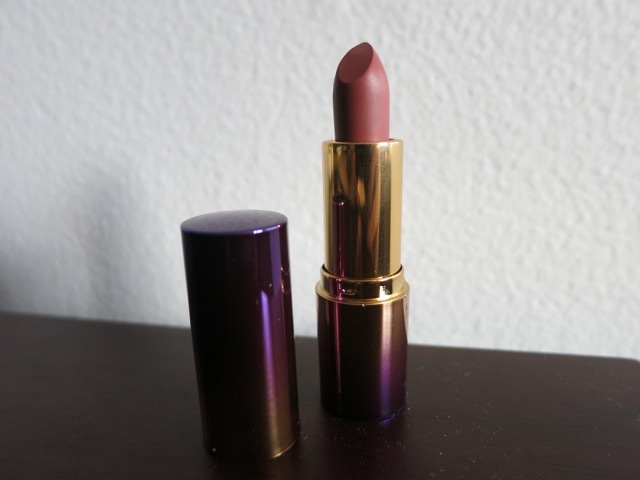 The lipstick has a pleasant fruity scent, applies very smoothly, and offers full coverage. Two thumbs up! The next product sample is the Deep Dive Cleansing Gel (full-size, $25). This cleanser is infused with lavender oil for balance and soothing and it also contains Vitamin C for brightening. I washed my face with it before bed last night, and I liked it. It foams up very well—a little goes a long way, which is good considering it’s not super cheap. My skin felt well cleansed and fresh, and I’d definitely think about buying this product full sized in the future. Plus, the bottle is just SO pretty (these things do count)! The other skin care sample in the kit is the Marine Boosting Mist (full-size, $25). In the words of SNL‘s Stefon, “this product has everything.” According to the brand, the mist is a four-in-one multitasker that functions as a primer, makeup setting spray, hydrating mist, AND skin refresher. This stuff has a definite beachy scent to it, which I’m certainly not opposed to. 😛 I’ll enjoy testing this mist out and seeing if it lives up to all the claims. Also included in the kit (and is the only item that’s not part of the Rainforest of the Sea collection) is a mini Lights, Camera, Lashes™ 4-in-1 Mascara (full-size, $21), which I became a fan of when I received a sample in a previous tarte VIB reward kit. This stuff is actually my current mascara of choice, and it’ll be nice to have a mini version for traveling. 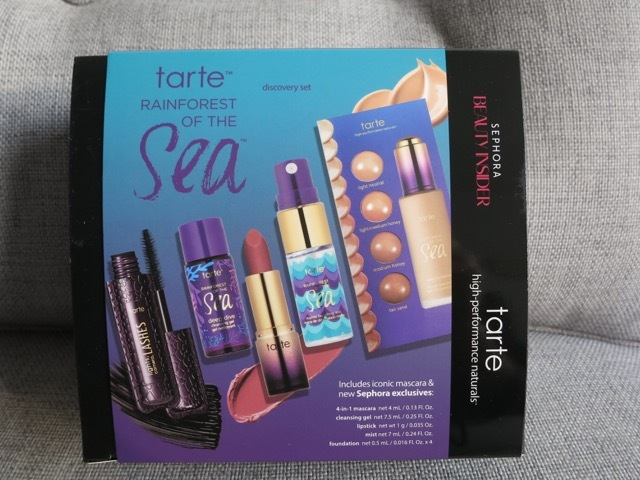 Did you get the tarte VIB reward, or have you tried any products from their new Rainforest of the Sea collection? What do you think of them?